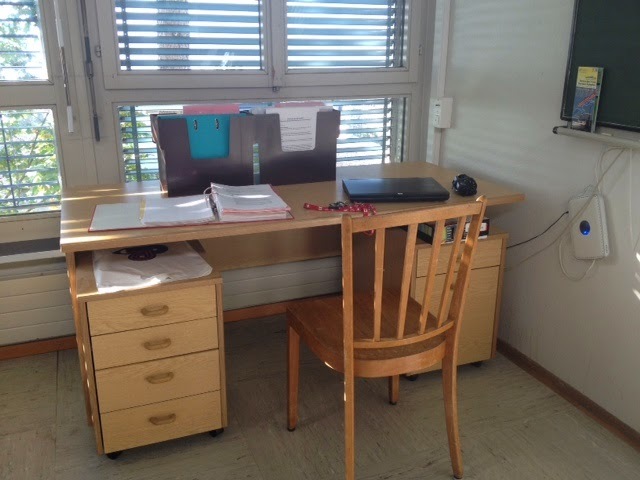 This week, starting Wednesday I have (finally) begun my new life in Neuchâtel, that of a teacher of English and Drama. Well, I haven't actually done any teaching yet, but I have been at the school for the past three days. And for you non-teachers out there, that is still working. This year, I am one of five new teachers joining the staff at Neuchâtel Junior College, an unusually large turnover in this small school. In fact, the newcomers outnumber the returning teaching staff, as there are only nine of us all together. We "newbies" have a lot to learn; this week's meetings are invaluable information sessions for us. Dan and Paul on a break during a staff meeting. We have spent about nine hours in staff meetings, covering a variety of topics: we have introduced ourselves, of course; we have learned what deductions to expect from our paycheques; we are being prepped to take questions from our students about the University application process for Canadian, American and British schools; we are planning next week's orientation week upon the students' arrival; we are learning the pros and cons of AP examinations; in short, over a few days, we are cramming in information that puts us one step ahead of our students - we hope. When we haven't been in meetings together, we have worked individually in our classrooms, familiarizing ourselves with our workplaces. I love my classroom. The first thing I noticed when I walked in was how much light gets in. 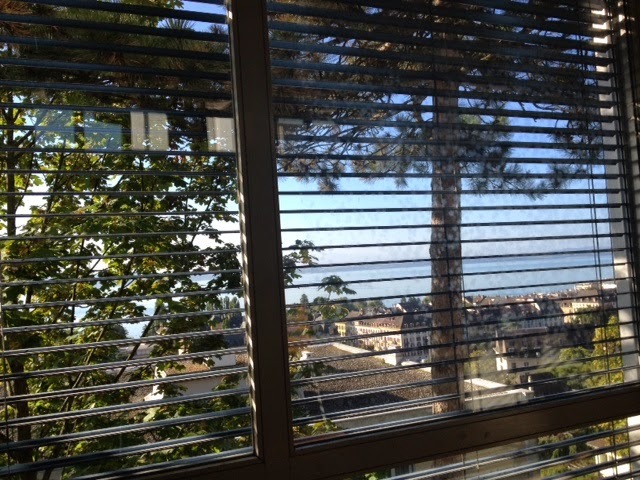 There are windows on two sides; facing south, the large ones, with slatted blinds, look out over the town below, Lake Neuchâtel beyond, and in the distance, the Alps. There is a smaller set of windows on the upper wall opposite, that lets in light from the north. 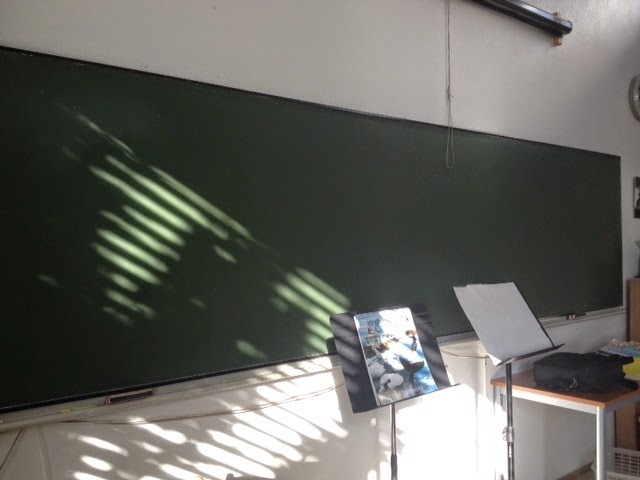 The green blackboard at the front of the room. I like the little music stands too. 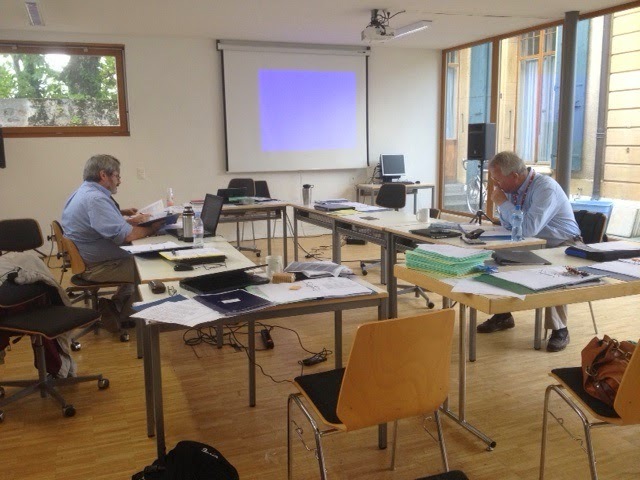 The room is well organized and well equipped. I have two blackboards to use on days when I teach "old school", or I can use my laptop to interface with the digital projector on the ceiling and show a power-point presentation. 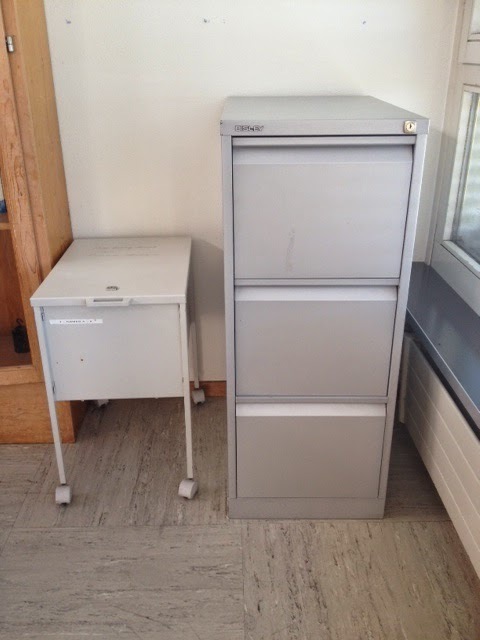 In one cupboard, I have office supplies, including a Swiss style two-hole punch. I have been very spoiled by Jocelyn, my predecessor. She has left me binders full of resources and notes so that I have lots to work with for all three of my courses. 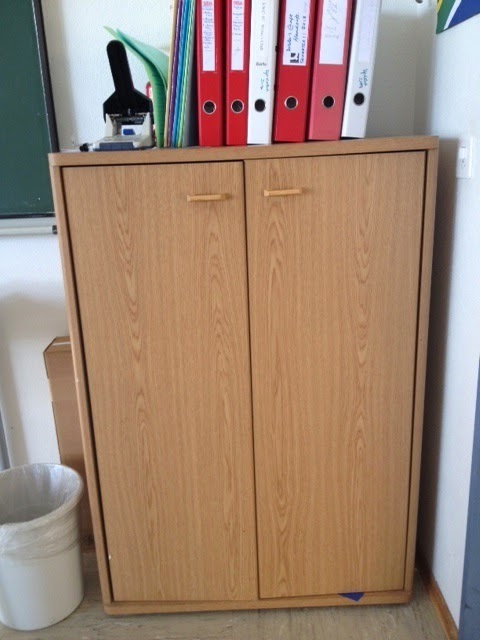 In the filing cabinets in the corner, I have a collection of scripts for Drama and NESDA, a performance club for which I will be a staff advisor. 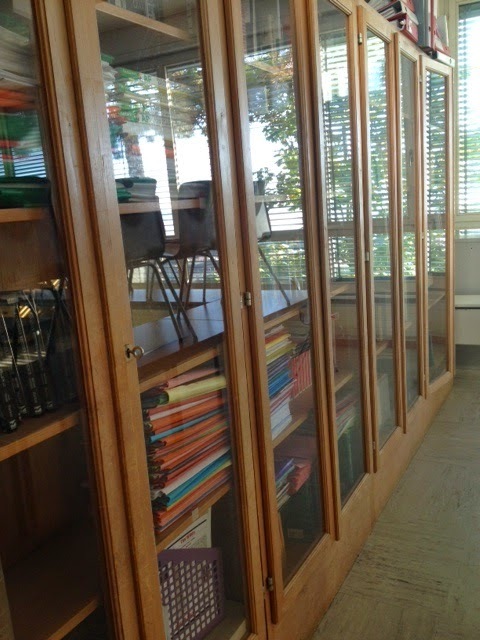 The beautiful glass cupboards at the back of the room are filled with standard English teacher fare such as The Norton Anthology, but also with modern novels, some of which I have not yet read. I have my Kobo with me here but I look forward to picking up a real book from this collection just for the feel of it. 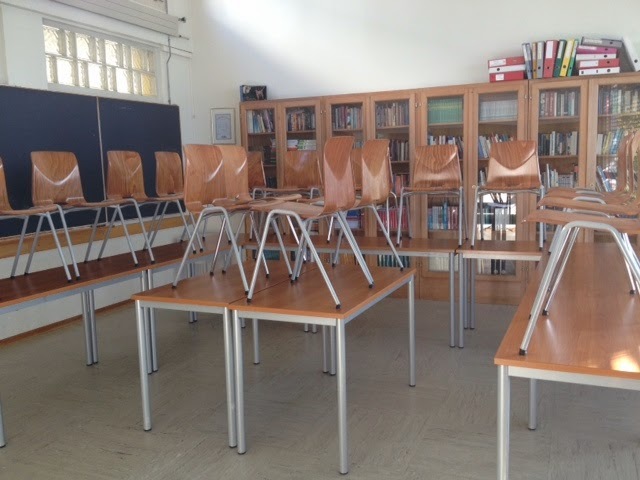 In the middle of the room are tables and chairs for my students. This selection of furniture will allow me many options for group work or presentations. My desk is in a corner, facing away from the room rather than towards it. I may have to turn it around, since, contrary to rumour, I really do not have eyes in the back of my head. Where the students will be. My room will be an oasis for part of every day, and then it will be transformed by youthful energy into something else, a hub of learning I expect.